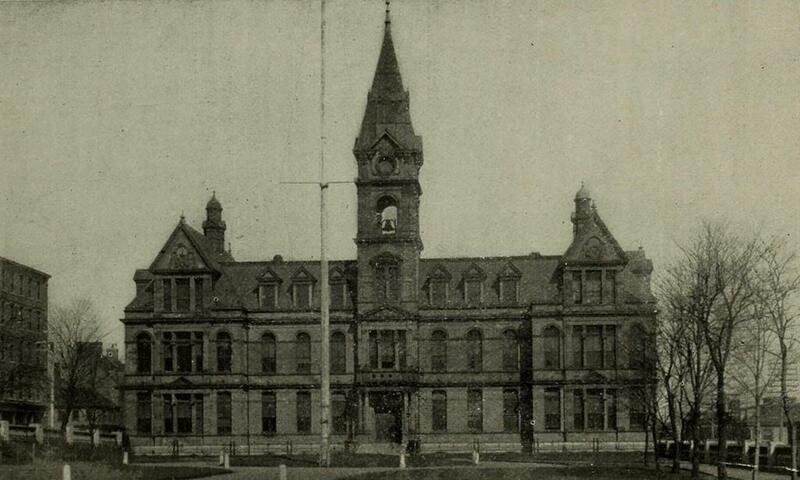 Halifax City Hall, seen from the Grand Parade around 1899. Image from Souvenir, One Hundred and Fiftieth Anniversary, City of Halifax (1899). 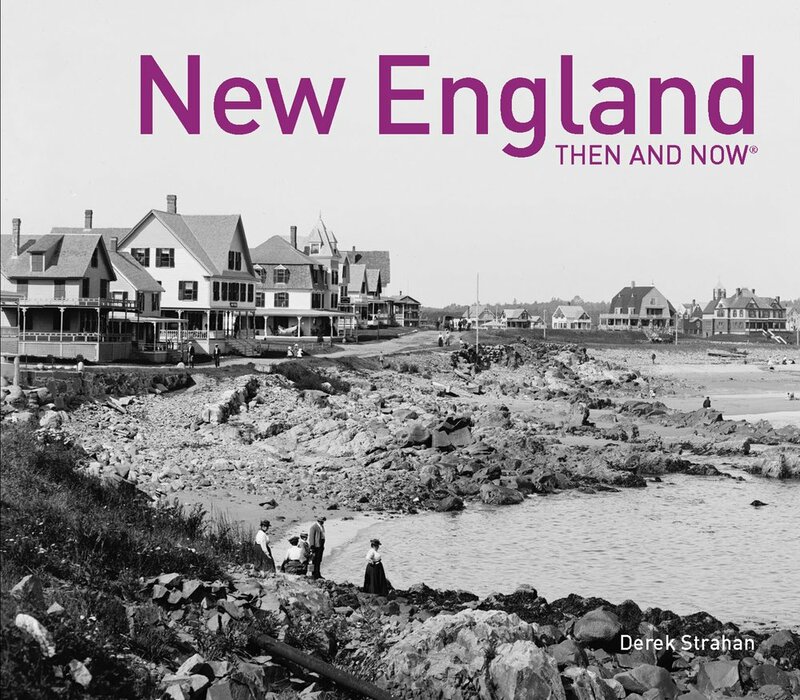 As mentioned in the previous post, Halifax is the largest city in Canada’s Maritime provinces, and has had close ties to New England over the years. 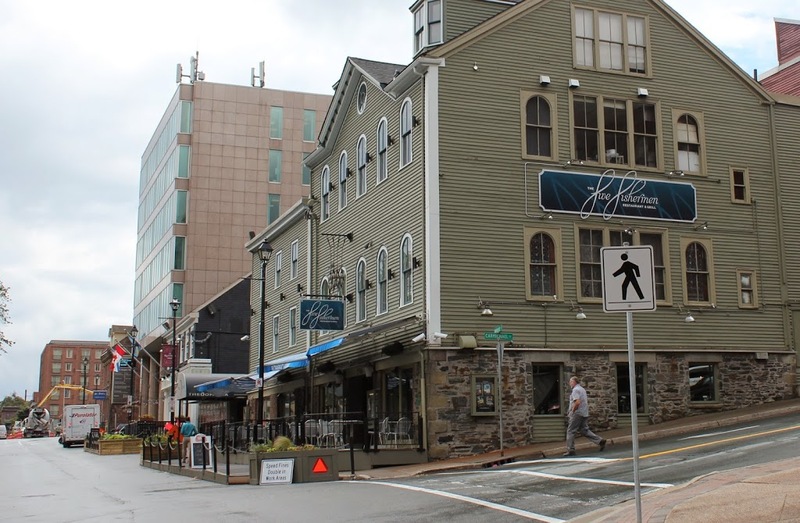 The heart of downtown Halifax has long centered around the Grand Parade here, a city square located between Barrington and Argyle Streets. On the south side of the square is St. Paul’s Church, the oldest building in the city, and on the north side is City Hall, seen here. It was completed in 1890, with an architectural design that is based on the Second Empire style, which had been particularly popular a couple of decades earlier. 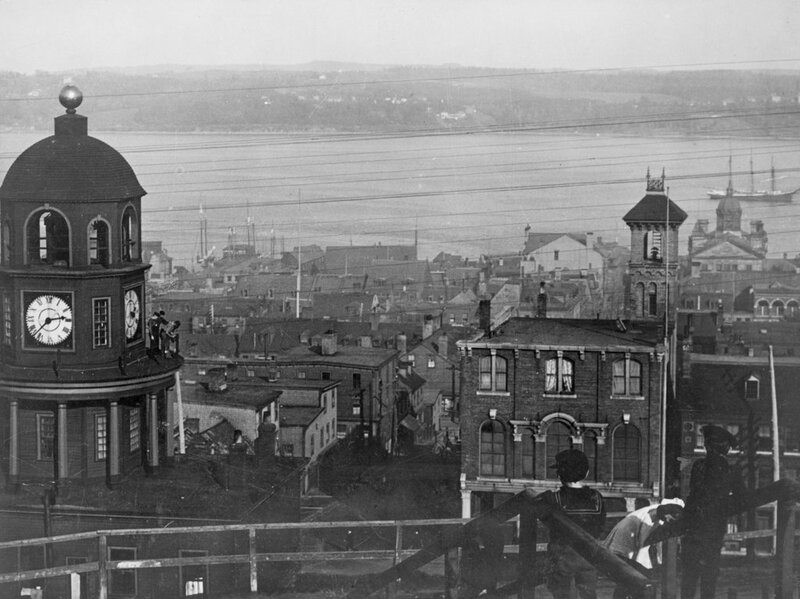 The building sustained some damage in the 1917 Halifax Explosion, but unlike the northern part of the city, the downtown area was largely spared serious damage. Today, the building remains essentially the same as it did in the 1890s view, and is listed as a National Historic Site of Canada. 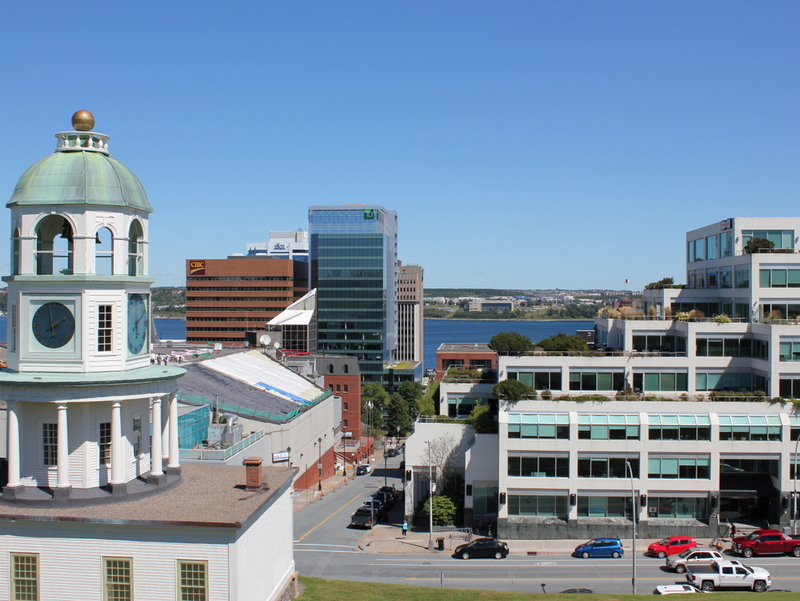 Its jurisdiction has significantly expanded over the years, though, In 1996, all of the existing cities and towns in Halifax County were consolidated into the Halifax Regional Municipality. 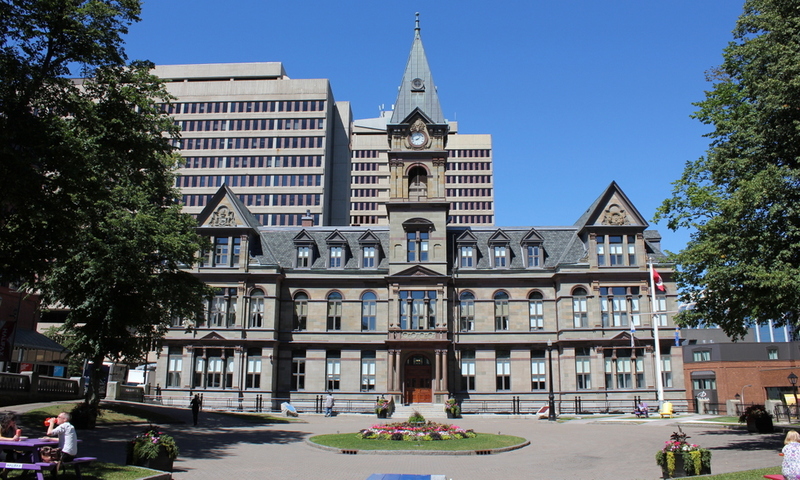 This essentially extended the Halifax city limits to include over 2,100 square miles of land, more than double the land area of Rhode Island, but the old City Hall remains in use as the seat of the municipal government, over 125 years after its completion. Looking down Argyle Street from George Street in downtown Halifax, Nova Scotia, in December 1917. Photo courtesy of the Nova Scotia Archives. 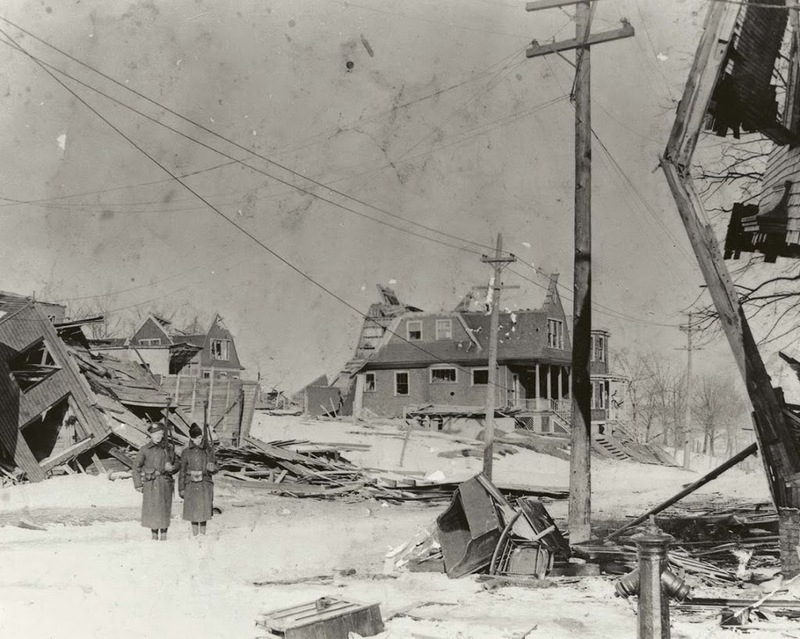 Out of the photos that I’ve posted about the Halifax Explosion, this is the only one that doesn’t show an area affected by the blast. However, what the 1917 photo does show is far more powerful. At first glance, nothing seems out of the ordinary, except for the stacks of wooden boxes on the street. 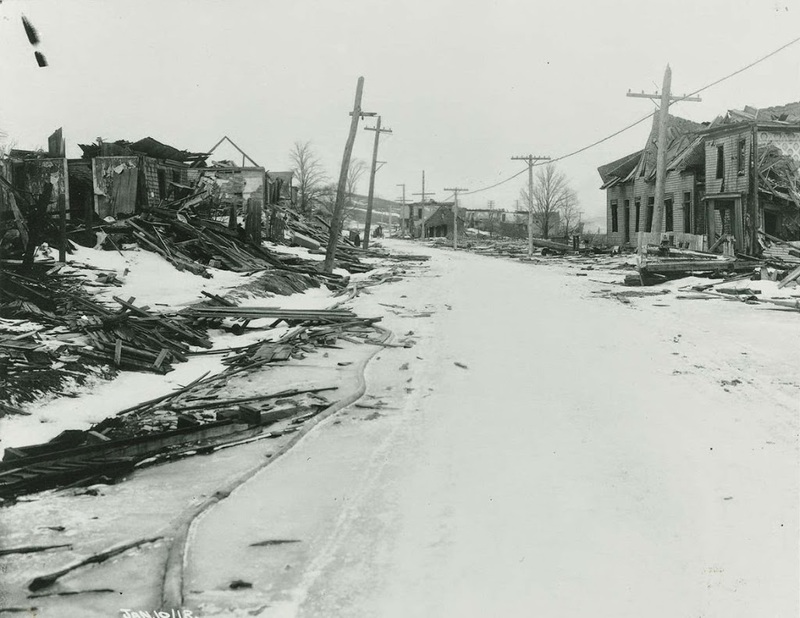 Except they’re not just wooden boxes; the sign on the second building from the right reads “Undertakers,” and the coffins outside were just a sampling of what was needed for the approximately 2,000 victims of the disaster. 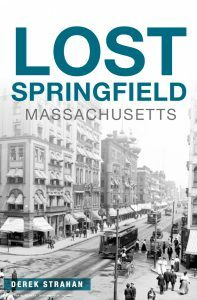 Incidentally, this wasn’t the first time that the building dealt with a major tragedy – just five years earlier the recovery operation for the bodies of Titanic victims was operated out of the city, as it was the closest major port to the disaster. During that time, the mortuary here was used to care for the remains of some of the victims, including John Jacob Astor and Charles M. Hayes. 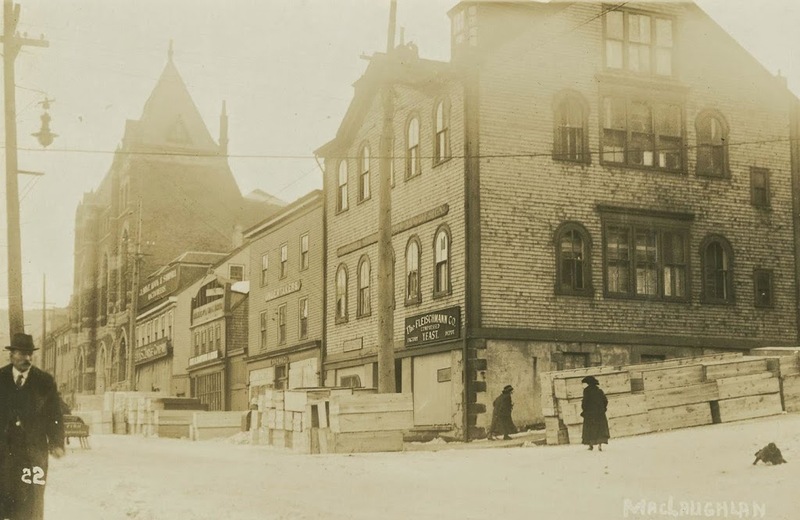 Another scene on Campbell Road (today’s Barrington Street) in Halifax, Nova Scotia, before the 1917 Halifax Explosion. Photo courtesy of the Nova Scotia Archives. The first photo is undated, but the absolute earliest date would be 1888, although it is probably a little later than that, perhaps around 1900. A few clues give it away, with one being fairly obvious: the Coca Cola advertisement on the side of the building. Coca Cola was established in 1886, but it is unlikely that it would have made its way to Canada so quickly. Perhaps less obvious of a clue is the bicycle leaning against the mailbox; this now-ubiquitous style of bicycle, known as the “safety bicycle” – because it was safer than a penny farthing – was not developed until the late 1880s. 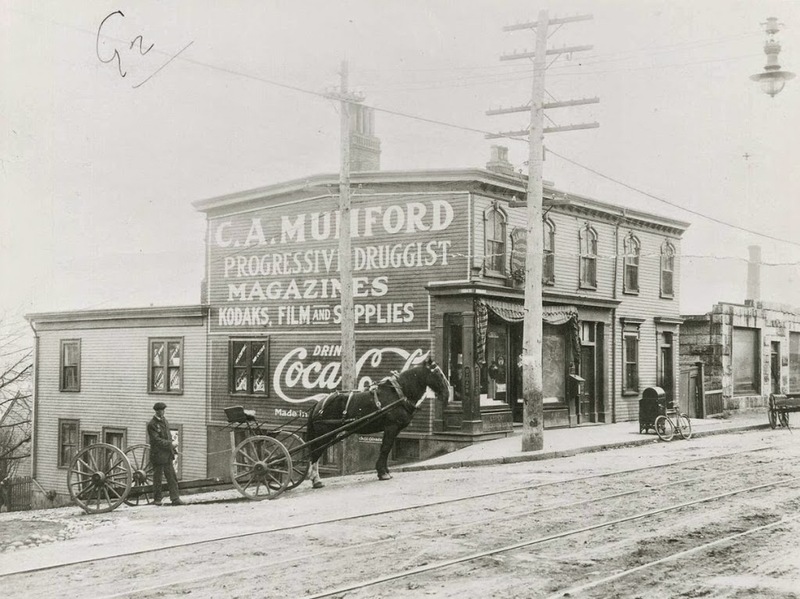 Finally, the reference to “Kodaks” in the drugstore sign indicates that it must be 1888 or later, and probably later. Kodak was founded in 1888, but the sign seems to indicate that people were already familiar with it by then, which suggests a somewhat later date. 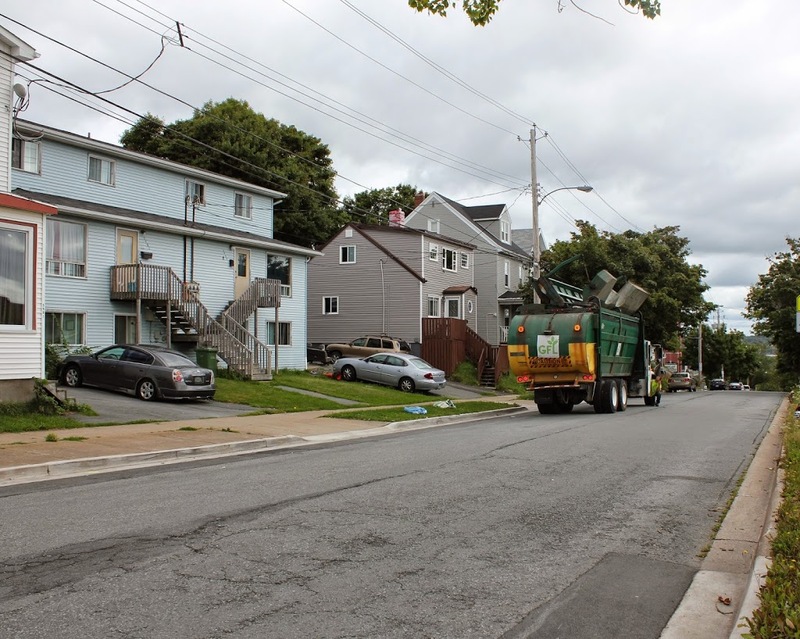 These photos were taken from almost the same spot as the ones in this post, just from a slightly different angle, at the corner of Barrington and Young Streets. 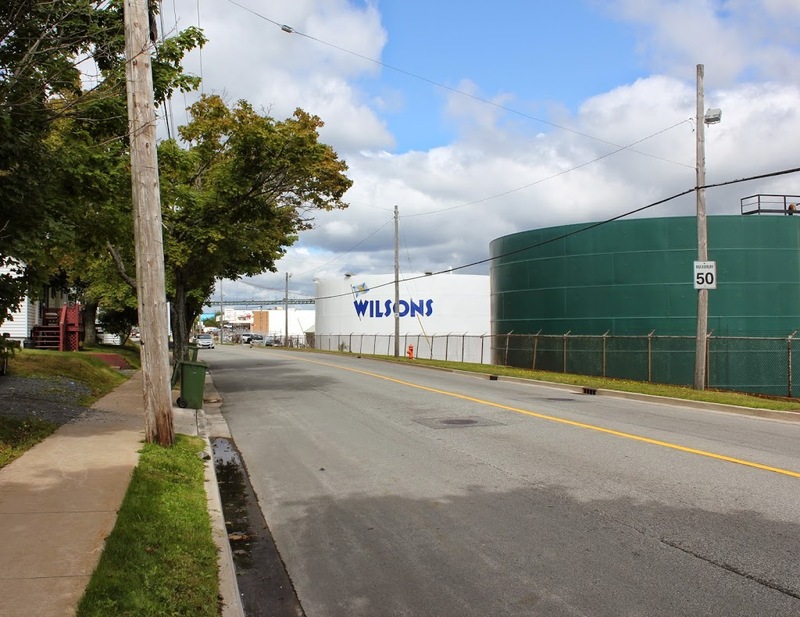 As mentioned in the other post, this entire area would be leveled by the 1917 Halifax Explosion, and today the scene looks entirely different. 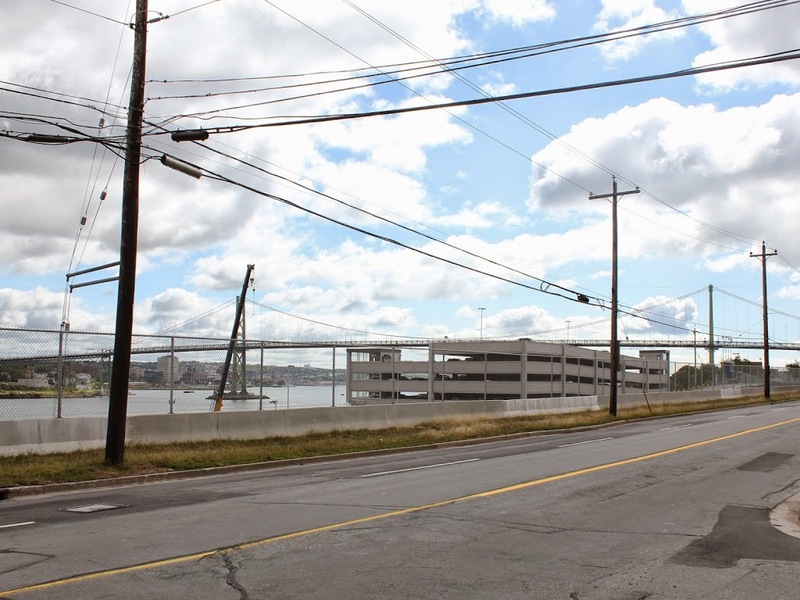 In the distance is the Angus L. MacDonald Bridge, one of two that cross the Narrows of Halifax Harbour, the same area where the explosion occurred.